Is there anything more maligned than the business meeting? We spend a lot time in meetings, and a lot of time complaining about how ineffective they are. Building better meetings is a passion of mine, so I want to share a tool and practices with you that I think will help turn your meetings from awful to awesome. 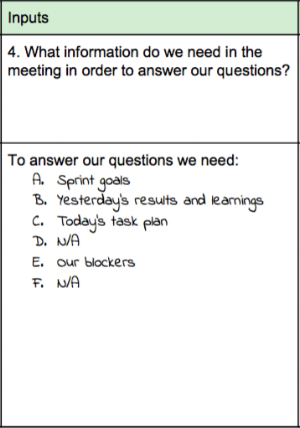 The first step to making meetings better is to answer the question, WHAT IS A MEETING? Turns out it’s much more than the actual time we spend in the meeting. Let’s break it down. Creating a successful meeting requires five essential steps. When focused, these parts fit together to generate a meeting that is effective and creates value for the participants and organization. Step 1: Pre-work - the work we do to ensure we have the right information in the meeting. Step 2: Inputs - the information we need in the meeting in order to get to done (which people, what data, what tools). Step 3: The Meeting (or what I often call The Messy Middle) - the questions we need to answer together in the meeting in order to get to our outcomes. Step 4: Outputs - the specific results of the meeting (decisions, answers, next steps, more questions). Step 5: Outcomes - the different world we now have for this group of people (and our organization) based on the results of our meeting. When people start working on meetings, they often focus on Step 3 first - trying to define the meeting content or agenda. But this typically gets us too focused on “how” and not “why”. Instead, I like to work backwards. If your meetings aren’t giving you useful Outputs and Outcomes, try focusing first on the world after the meeting, by defining the Outcomes you want. How will things be different when we are done? Defining Outcomes requires thinking critically about how the meeting will change the world. That might sound lofty, but if we set that level of expectation for every meeting, we can make better choices about how we structure and invest in them. As I work with meeting leaders on Outcomes, I ask them to consider the kind of engagement they want from their attendees. I like to use this model for decision making from Peter Senge’s great work “The Fifth Discipline Fieldbook”. Knowing what kind of engagement we expect from the people in the meeting will help us define outcomes appropriately. Example: Project assignment meeting. Note: these types of meetings can sometimes be replaced with asynchronous communication. Testing: Inform about a draft plan/decision and then collaborate to test the draft and possibly iterate. Example: Planning to implement new architecture. Consulting: Iterate on and rework a draft plan/decision. Co-creating: Create a result together, as peers, working from a contextual baseline. It’s possible to engage in more than one engagement mode in a single meeting. Based on the engagement mode(s), we can craft Outcomes that are explicit about how the world will change. By focusing first on the outcomes, and then backing into all of the work to prepare for and deliver a successful meeting, we can answer all the important questions about who, what, and why before we get into the room. And that will help us deliver better, more successful meetings. Want to give it a try? 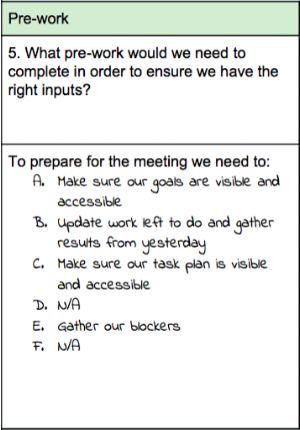 Download the Meeting Preparation template. And let me know how it works, or doesn’t, in your situations.